We’ve come use to writing about big jackpot casino winners at Casumo, but what makes this story interesting is that it wasn’t a jackpot that led to the big win, it was some great slots choice and lucky spins. It’s unusual to find stories about slots players who’ve won this type of big cash prize not playing on a jackpot slot. We not saying you don’t find it, just look at the £290,000 32 year old Michael managed to score on the Laser Fruit at Vera&John, it’s just not very common. So when Casumo casino told us about one of their Finnish casino players managing to rack up such a huge slot win from just €100 in deposits, we were intrigued firstly by how he managed to do it, and secondly which slot machines he was playing on. All of which we have for you in this big winner story so read on if you want to find out which were the lucky games, or if you’re short on time just skip down a little. 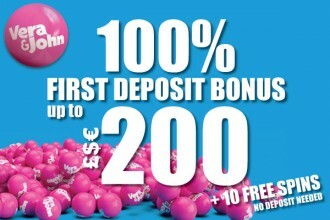 A single deposit of just €100 was all it took this slots player from Finland to tally up such a big win. It was only one deposit, but it did take 8 days to do. We’re not expecting that he was betting solidly for eight straight days though, this is just the time period from which he made his first deposit to the time he decided to press the cashout button. 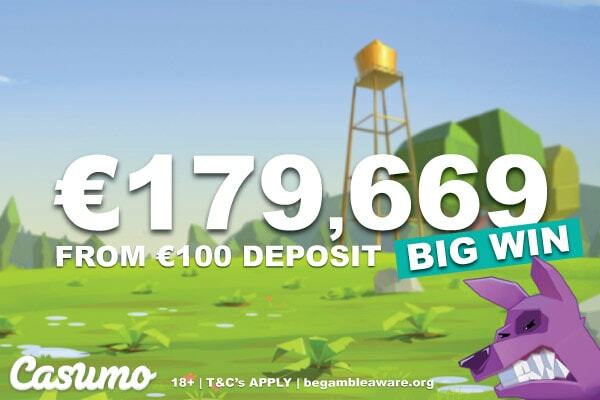 We’re guessing he was gambling responsibly within this time, and certainly with in his means as it took some patience, some lucky spins and a good selection of slot games to create such a huge pay day from that initial €100 he deposited in to his Casumo account. There are varying types of slots players around the world. You’ve got those who just like to spin a few rounds and see what the luck brings, those who like the big jackpot slots in the hope to win millions and then those that like to try out a slot strategy or two to see if they can improves their odds of winning. We believe this lucky Fin falls in to that last category, with a little bit of luck thrown in. Why do we think this? Well, it’s down to the games that he chose to play, the payouts and returns they offer along with the amounts you can bet gave him the chance to if luck was on his side get some good payouts. And obviously the fact that he won nearly €180,000 in just 8 days seems to suggest Lady Luck was somewhere around, either that or we want his slot strategy so we can try and repeat his winning ways. Which leads us on to the casino slot machines he chose to spin. The four slot games his chose to spin from the huge range of slots at Casumo were all very different in terms of theme and provider. But one thing that they all have in common is that they offer good return to player rates and are medium to high volatility leading to the potential for some big wins. Combine that with a slot strategy where you switch between games and increase bets depending on the size of your bank roll and you have a good chance of walking away up like this happy Fin did. Wild Swarm – A 5 reel, 20 payline game from Push Gaming, it might not be an obvious choice for many but this medium variance game offers free spins with sticky wilds as well as 97.03% RTP and Instant Win games. Diamond Mine Slot – A 6 reel with up to 117,649 ways to win this game offers the chance for some big base game wins along with free spins with unlimited multipliers, cascading symbols and mystery symbols. Fat Rabbit Slot – A 5 reel, 50 payline machine, this medium to high variance slot gives you free spins with increasing in size mega wild symbols with a 96.45% RTP. A fun game where the free spins give you the biggest wins. Sakura Fortune Slot – A 5 reel, 40 payline game from Quickspin this high variance machine lets you with up to 950x your total bet thanks to free spins with sticky wild reels and mystery nudges. Ok so Fat Rabbit and Wild Swarm are from the same provider, but the themes are different and each game is worthy of spinning thanks to great features and the chance to win some decent amounts. What will Casumo slots winner do with his winnings? We always like to find out what winners will do with their newly found mini or life changing fortunes as it gives us a little insight in to the players life and mentality. Unlike many who go for splashing out on fancy holidays, new flashy cars or a new home, this Fin has another way in which he will use his winnings. A sensible chap, he told Casumo support staff when they contacted him that he’d be having a small celebration followed by investing the largest part of what remains. Investing in what, we are not quite sure, it could be stocks and shares, property, or something completely different, but it gives him another chance to see if he can continue to grow that initial €100 further than €179,669 he managed to win. Is it time to take a spin at Casumo? What this Finnish player likes about playing at Casumo is the friendly customer service and the exciting Casumo adventure. It’s a casino that looks after its players offers slot tournaments every 30 minutes, chances to win big every week and of course their bonus filled adventure which lets the excitement and thrills keep on going day after day. If you’re looking for a new casino site to play your favourite slots at or try some new games then we recommend you head over to Casumo and give it a go, it might be a little quirky but it’s definitely worth a look whether your from UK, Canada, New Zealand or of course Finland.